You can open any query that you saved or any query saved by other users that they designated "Global". View the properties assigned to this query (for example, the name of the owner). To do this, click Query Properties. Execute the query. To do this, click Execute Query. Modify the query and save over it (replace it). To do this, make the desired changes, and then click Save Query. Modify the query and save a copy of it. To do this, make the desired changes, and then Save Query As. 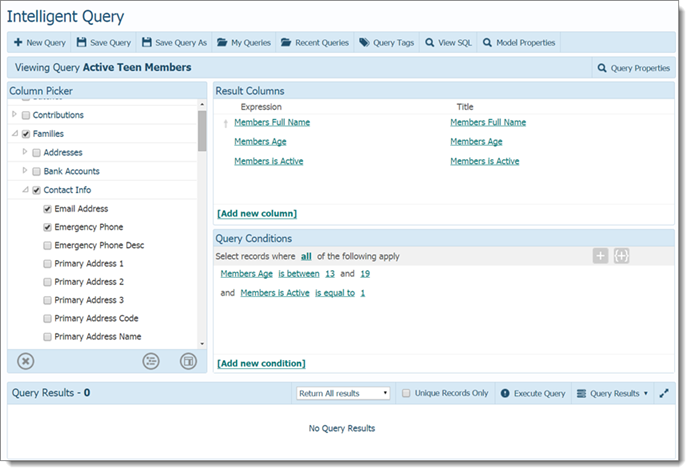 ParishSOFT IQ provides quick access to the last 12 queries you viewed. Click Recent Queries to open the Recent Queries window. Modify the query and save a copy of it under a new name. To do this, make the desired changes, and then Save Query As.